Need something to watch? Read our running list of the Best Movies of 2017. Matthew McConaughey says the word "bourbon" like he's being paid by the syllable. Say it with me: BURRRR-BOU-AAANNNN. It sounds the way a musty leather-bound book tastes. So, it's unsurprising that Wild Turkey, the popular Kentucky bourbon brand, recruited the wayward Lincoln lover as its Creative Director. What exactly does a title like this mean? According to a press release, the Oscar-winning actor will be the "chief storyteller for Wild Turkey both behind the camera and in front of it reintroducing the world to the legendary Bourbon brand, starting with a series of television and digital advertising campaigns he is directing, which will launch in September." If you want a taste of that campaign, check out the video below. 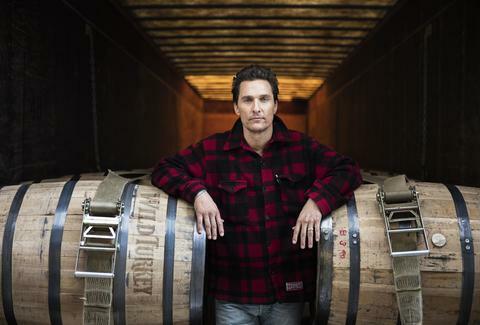 The clip finds McConaughey wearing the preferred flannel-jacket of high school bullies, gazing out at a river, and walking around whiskey barrels with Wild Turkey employees. The whole thing is strange, a bourbon-soaked journey into where ads are headed: the celebrity not as spokesman, but as auteur! Plus, at six minutes, it's shorter than Free State of Jones. "I wanna be more than just the face of the campaign," says McConaughey in the video. "I wanna have my hands in the clay of how we tell the story and I want to be a part of the whole story -- not just a character in it." Get those hands in the clay, Surfer, Dude! If the 6-minute short film version of the ad is too much for you -- we understand, your time is as precious as every drop of Wild Turkey -- the company has also chopped up a shorter 30-second version of the spot. It retains the same dusty, lived-in vibe. It's a light sip of a commercial. Here's the thing: Judging from the taste we've gotten of this campaign, it feels like the True Detective actor is still playing a "character." He's playing Matthew McConaughey, bongo enthusiast, drinker of whiskey, and guy who can draw a diagram explaining the plot of Interstellar on the back of a bar napkin if you ask politely. And he's playing that character really well, as best defined by how he says "bourbon" like it's the secret password to enlightenment. The McConaissance may be over, but the McBourbonaissance is here. Dan Jackson is a staff writer at Thrillist Entertainment, and swears he's going to watch Free State of Jones one of these days. He's on Twitter: @danielvjackson.